low carb Indian snacks, low carb snacks. 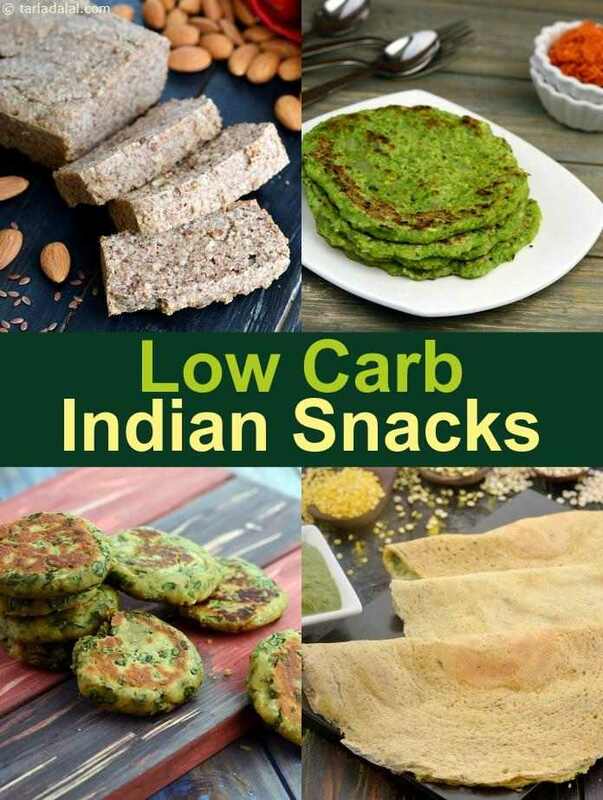 We have made a lovely collection of Low Carb Indian snacks. True, traditional snacks are loaded with carbs, but here are some super snazzy, Indian low-carb options that you would love to try from Grilled Snacks to Tikkis to Smoothies and Juices. We have Indian tikkis, chilas and kebabs which are low carb snacks. Indian pancakes made with moong dal and green peas and safe for diabetics, Green Pea Pancakes. We used protein rich Moong Dal in Oats Moong Dal Tikki. Yes, we have a pancake made without plain flour and sugar. Its coconut flour , coconut milk and eggs based recipe called Coconut Flour Pancakes. For mushroom lovers, try the khumb ke kebab recipe where each kebab has 5 grams of carb, do restrict intake. Chilas without rice. Yes, mixed dal chilas recipe are made with green moong dal, yellow moong dal and urad dal so the carbs are just 7 grams per chilas. These are quick and easy to make and always tasty. We have grilled them in olive oil which is a good Omega 3 healthy fatty acid. Try Grilled Mushrooms and Grilled Baingan where brinjal is grilled in olive oil and has only 2 grams of carb per slice. A great way to have a smoothie and juice at breakfast or afternoon snack is to have a healthy smoothie. We have avoided using bananas and sugar in these recipes and full details are available at Low Carb Juices Smoothies Drinks recipes. Try avocado spinach pear smoothie recipe which has 13 grams of carb and loads of healthy fat from avocado. Paneer contains high quality protein and calcium which aids in weight loss. Since paneer is low in carbs and high in protein it gets digested slowly and hence good for diabetes. Malai chilli paneer flakes balls cold starter recipe is just 0.6 grams of carbs. Even this works for keto. Malai paneer bell peppers cold starter recipe (0.9 games of cab per piece), malai paneer dill balls recipe ( 0.7 grams of carb per ball), malai paneer sesame seeds balls recipe (1.7 grams of carb) and lastly malai paneer with mixed herbs balls recipe. You will find our entire collection of Vegetarian Low Carb recipes at Low Carb Diet recipes which also has Low Carb Indian Lunch recipes and Low Carb Indian Dinner Recipes with each recipe having detailed nutritional value. Try the sukhi bhindi recipe which we love and has only 6 grams of carbs. We hope you enjoy our recipes and would love to get your comments on this article. Enjoy our low carb Indian snacks, low carb snacks and other low carb recipe articles below.